I am not first person with ADHD to be skeptical about mindfulness, meditation and all that it involves. If you read my article on learning to meditate with ADHD you already know I have completely changed my thinking on the topic. These days meditation is a normal part of my day. Not that I am an expert, it’s still work. I have wanted to read Lidia Zylowska, MD’s book for quite some time so I ordered it from Amazon. Dr. Zylowska starts by explaining the roll of self-regulation and executive functions in ADHD. She uses information and quotes from Dr. Russell Barkley, which I love because I am a bit of a Barkley fan girl. She does a good job of explaining the research background of mindfulness practice and her sources of information are great. I also found that everything she said about self-regulation was pretty much spot-on. Step 2 of Zylowska’s program involves breath work. She explains how to sit, and how to handle it if your mind wanders. My private group discuss emotional management more than any other topic related to ADHD. Emotions are “shaded”. As in there are universally understood emotions, and also mixed emotions. It is important for us to be able to name emotions. Emotions are fluid and changing, with varying intensity. Emotions derive in both the mind and the body. The more in tune we are with our emotions, the more able we will be to handle them. 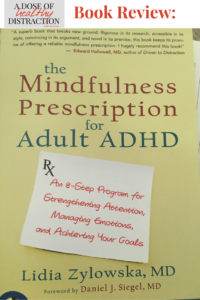 Dr. Zylowska explains the role of mindfulness meditation in identifying and coping with the mood swings often experienced by those of us with ADHD. The best part of this book is the cd of guided meditations that come with it. This is perfect for beginners looking to learn how to meditate with ADHD. The writing is well-researched and explained in a way that doesn’t sound off-putting to even the most resistant critic of mindfulness. Meditations are outlined in writing and then reinforced with the cd.